As part of Design Week RI, Sky Sabin Productions just published a great little video featuring our founder Peter Case talking about Truth Box Architects and the merits of being a designer and small business owner in Rhode Island. Thanks to Sky Sabin Productions and DESIGNxRI! Where to start? It's been a busy summer at Truth Box Architects. We're excited to announce that we have broken ground on the Urban Greens Grocery Co-op at 93 Cranston Street. This project has been in the works for nearly two years and we couldn't be more excited to see the site work begin. The Urban Greens Grocery Co-op will be an 8500sf grocery facility dedicated to serving the local, diverse communities of Providence's West Side. 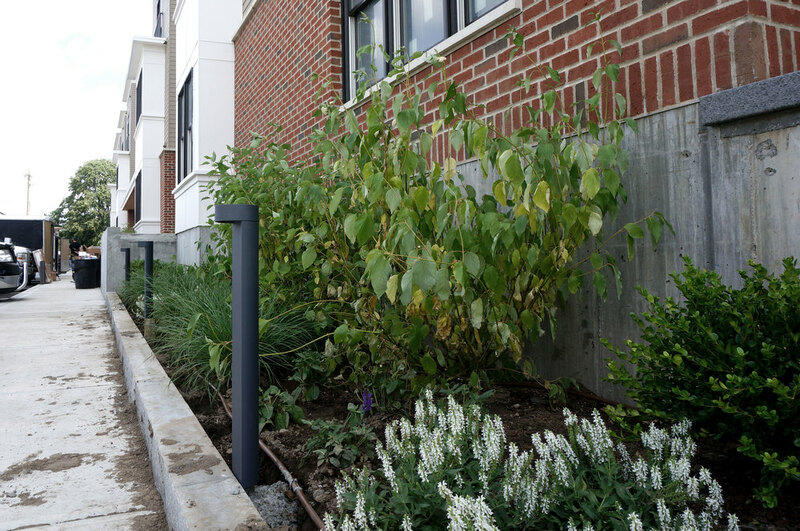 We've been working closely with the dedicated team at Urban Greens and are proud to be part of this project. In addition to the grocery co-op, we will also be building a 30-unit multi-family apartment building at 93 Cranston Street. This building features a mix of affordable and work-force housing and will, of course, exceed code requirements for energy efficiency and performance. Work continues on the multifamily rehab at 101 Hillside (pictured above). The crews have been hustling all summer and we're anticipating completion this fall. We should be announcing open houses shortly. So if you're looking for a studio, one-bedroom, or two-bedroom apartment on the East Side, make sure to give our property manager Kate Galvin a call: 401-450-0731. More at www.101-hillside.com. Last but not least, we've had some significant changes in the office this month. Rob Williams and his family have re-located to the Pioneer Valley. But don't worry! Rob is still with us and will continue to be a committed member of the team working remotely and making periodic visits back to Providence. 125 Midway is nearing completion - the punch list might even be starting to get shorter rather than longer. Jordan's crew is doing a great job with all the finish work and tying up all the loose ends. The parking lot and drive was completed, the landscaping installed, metal railings are being fabricated and installed, tilework, finish cabinetry, and accessories continue in the units. It's all shaping up very nicely. We're scheduled for final blower door tests next week and will be sure to share the results. Check out project photos below. It's been a busy Spring here at Truth Box. We were pleased to announce being part of the development team and architects for the Louttit Laundry Redevelopment project right here in Providence's West End. Located on a the abandoned site of the former Louttit Laundry facilities, this project is a true mixed-use, urban infill development. The project includes two buildings. The first, located on Cranston Street, includes a large ground floor retail space currently being designed to house the Urban Greens Food Co-Op along with 12 residential units above. The second building is a dedicated residential building with 27 one and two bedroom units located above a parking structure. Both buildings, as usual, will be super-insulated energy efficient buildings. The residential units are slated to be either workforce housing or affordable housing. We couldn't be more exited to be part of this team and have been working diligently on schematic building design, site design, and permitting process this Spring. Beginning last fall we have been working with New Urban Arts - an absolutely wonderful non-profit that runs arts programs for high school students - on expanding their studio and programming spaces within their existing basement. Among other things, the project features a wide open staircase that will connect the existing studio space with the new space below. The railings are all being designed in collaboration with The Steel Yard. The contractor has been selected and construction is scheduled to begin this May. We're looking forward to it. Progress continues unabated at 125 Midway. We've shifted out attention towards the interiors and are up to our ears in details, finishes, and material selections. We've completed a fully finished and furnished model unit that looks great and is a moment of calm amidst the general construction chaos. The most exciting news this spring is that we've welcomed Laura Moss as a new employee in the office. Laura is a fellow RISD grad who has been working construction and design-build for a number of years in the Northeast. As such, she brings a lot of energy and a unique perspective to the office and we're glad to have her on board. Progress at 125 Midway never slows and now that spring is here we're excited to be entering the final phases of construction where we're focused on details, materials selections, and finishes. In the past month we've completed the model unit - it's a fully furnished oasis of calm and tranquility amidst the general chaos of a construction site. The painters are up on ladders painting the bays and exterior trim. The carpenters are installing the wood siding and mahogany sills at the main entry. The architects are scrambling to make final lighting selections. There's no shortage of work, but the end is starting to come into view. Windows installed and WRB (almost) installed. The framing at 125 Midway is complete and the building is essentially "dried-in" - all the windows are installed, the sliding glass doors are in place, the roof membrane is down, and, with few exceptions, the building paper is on. This is always a great moment in a project when you can walk through a fully framed building and finally "see" the spaces that have until now only existed on paper. So, what's the verdict? We're incredibly pleased with the results so far: the unit layouts are working very nicely, the proportions feel right, and some of the last minute changes have clearly paid off. There are a couple things that we've had to reconsider, but it wouldn't be a construction project without a couple of revisions. We're pleased to announce the completion of Phase 1 of the St. Marks Church Redevelopment project: 45 Pop Lofts. The first tenants moved in earlier this month and we're close to full occupancy. For this project we converted a decommissioned school building into 20 new, modern apartment units. After a full gut, the building features entirely new utilities, HVAC equipment, windows, new insulation, interior flooring, and finishes. As with all large-scale rehab projects, the primary challenge was determining how and where to preserve the original character of the building while ensuring modern finishes and features in the apartment units. One detail we're particularly proud of is the patterning of the windows on the facade. The original building featured huge windows across the entire width of the classroom; much too large for an apartment unit. So we paired down the windows to a more residential scale and filled in the opening with corrugated metal siding. The width of the openings allowed us to vary the pattern so that every unit has the same number of windows, but no two units have the exact same configuration. Not bad, right? Like all our projects, we focused on energy-efficiency and green building materials. Preliminary testing indicates the efforts were not in vain - there's very low air leakage and the high performance HVAC systems should keep the operating costs low. truth box in the news! 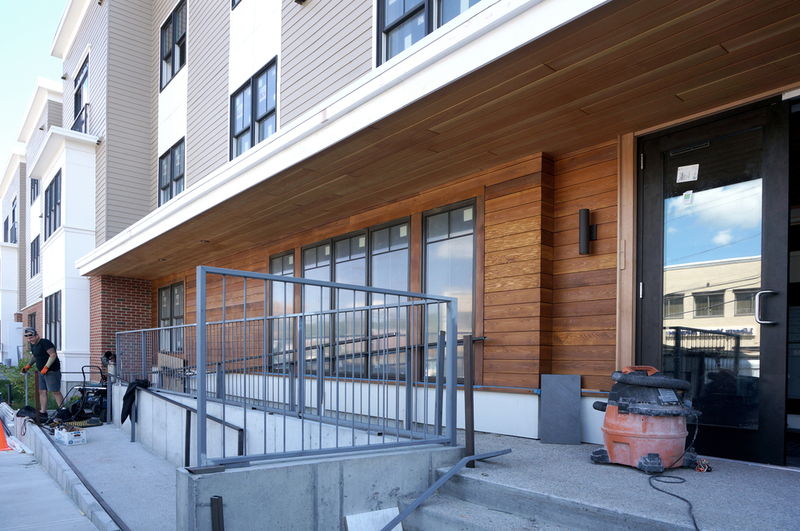 As of June 1st, our project outside of Garden City - 45 Pop Lofts - is complete and tenants began moving in. Garden City in the News! Our project just outside of Garden City - Garden City Housing: 45 Pop Lofts and 125 Midway - was recently featured in the Providence Journal. It's official: we're not the only ones who like our super-efficient townhouses on Battey Street. Earlier this fall, we received a silver from the Rhode Island Monthly Annual Design Awards. North Main Street in the News! Earlier this fall, the Providence Journal featured an article on our most recently completed project at 1261 North Main Street.